Given, and after first becoming aware of, or reviewing, thanks to the previous Factsheets E49 a and E49 b, the main issues that arise in precarious and informal habitat or shanty town areas, setting out which technical means can be applied to bring water to precarious habitat and shanty town areas. For the means relating to governance and management modes, please refer to Factsheet E 49d. For issues that are specific to sanitation, please refer to Factsheets A 15 and A 16. Precarious suburban habitat areas and shanty towns are most often built in very poor neighbourhoods, with few means of access to water and sanitation and where makeshift and unsanitary dwellings have been hastily built, often illegally, encouraging local authorities to not want to recognise them nor take any action that could lead their occupants to feel that they have any right to occupy them or gain access to public services. 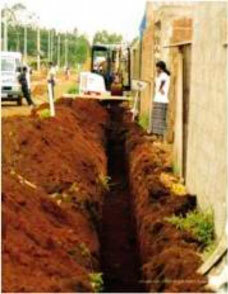 Many cities and towns therefore satisfy themselves with bringing their water pipes close to these areas. However, once the water is available nearby, or almost, it still needs to be brought to various points within the shanty town, then distributed to the population, something that most cities and towns often do not wish to do especially citing the fact that these are informal and therefore illegal neighbourhoods, but in doing so they are ignoring the new right to water for all recognised by the UN in 2011. Some more careful or more realistic cities and towns do however acknowledge, without actually legalising, the de-facto existence of these poor populations and make more or less of a contribution to the setting up of small specific water services, most often based on the efforts of the actual communities involved and small scale private operators. In those, most numerous, neighbourhoods where there are no private hook-ups to most homes, there are a number of substitute modes of water distribution : standpipes, sometimes springs or family wells or wells shared with neighbours and rain water collection, but there are especially the many small private water carriers and sellers and small private operators of water kiosks, drillings fitted with hand pumps or even actual networks. 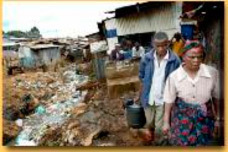 These various distribution modes are more or less extensively developed depending on the region and sometimes even depending on the various neighbourhoods within a shanty town. Most often they are run not by town or city authorities, who most often ignore them, but rather by associations or neighbourhood management committees or by small scale private operators who sometimes take excessive advantage of the situation by charging 30 or 50% more than the price of the water brought by the public municipal network, and sometimes even more than that. In practice, low income users often make a choice every day between the various water supply methods on offer, basing their choice on their available financial resources as well as on the time available to the family (who may be employed on a more productive task) as well as on the availability of water on offer that day from the various providers (and which may vary depending on the rains, pressure drops or the often frequent cuts in water supplies, for example). For lack of solutions provided by the town or city authorities or by major companies, numerous small scale local operators have set up a wide and highly diversified range of services from simply carrying water to the home, to operating standpipes or water kiosks and even managing small networks. The latter solution is doubtless the most interesting formula when it comes to properly serving the population at the lowest price and facilitating the transition later on towards a true public service. This environment, that plays an important role, is however a very varied one for there is not much in common between a water carrier and a utility network manager, between those who seek essentially to provide a service, even a paying one and those who are mainly in it for profit. In the same way, the nevertheless essential relationship that they maintain, or should maintain with the population and with the authorities are also very different. This is also explained by the great difference in contexts and situations encountered, which in turn lead to fairly diverse solutions, ones that the population sometimes actually chooses between every day. There is however still progress to be made to encourage better relations between these small scale private operators and the municipal authorities, if only to improve the organisation and coordination of services and to ensure that some prices do not get out of control. These are generally privately operated and fee paying but they may also be public. They represent one of the main ways for towns or landlords to supply homes without a private hook-up. They can be found pretty much everywhere, especially in India and Africa. Generally, they take the shape of a collective water point with a tap located at human height and connected to a simplified and small scale network belonging to the town or a resident’s association or to a manager. Standpipe are especially welcomed by the poorest users, for this kind of service lets them purchase water in small quantities thereby spreading out their spending. In some countries, e.g. in India, with exceptions like Mumbai (formerly Bombay), standpipes offer free or very low cost water. Unfortunately standpipes are sometimes not reliable and handy enough with drawbacks, including short operating periods, sometimes lasting only a few hours every day, requiring users to resupply at night and insufficient water pressure, all of which may lead to long queues. These are locations where water is again distributed by the litre or the container, but always sold by an operator - fee collector or a concession holder in the case of a private concession (they are women most often). The advantage of kiosks over standpipes is that despite their cost, they avoid water wastage, vandalism, and the lack of maintenance around the standpipe. But they are however generally limited in numbers to ensure that their operators or owners derive sufficient income from each water point, something that again may lead to long queues. Lastly, they are only open when an operator is present. 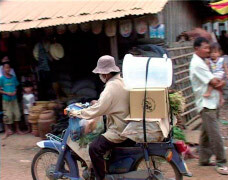 - Pushcarts, small carts fitted with two arms that can carry 100 to 200 litres of water. They are very widespread, for example in Ouagadougou (Burkina Faso) and Conakry (Guinea). - Tank vans or trucks. Carrying water by tank truck is mainly used to supply major users who have storage tanks. Despite their cost and the fact that they do not provide any real insurance of the quantity of water carried, all of these systems for delivering water to the home meet the needs of the poorest families, namely purchasing small amounts of drinking water (4 to 20 litres per person per day) when they need it and when they have enough money to pay for it while letting them use their time for other activities, whether working or looking for small jobs. They are also useful to other levels of society and categories of residents living in areas where the distribution network is not sufficiently developed. The price of this water sold to the home ranges in price between some €1 to €5 per cu. metre, depending on the town or city (in practice however, this water is actually sold for more per litre or per bucket to most inhabitants as it is only sold by the cu. 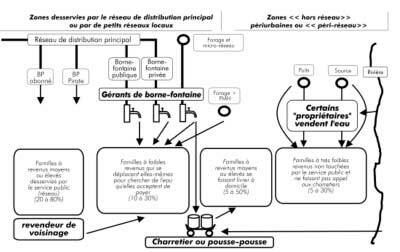 metre for wholesale purposes to concession holders or community associations), whereas the water sold from the standpipes in the same towns and cities is far less expensive, often ranging from €0.5 to €1.2 per cu. metre. Nevertheless, this price differential should not always be considered completely abusive after making allowance for the small quantities transported by a carrier every day (except when using a tank truck), the harshness of their work in the heat and on rough uneven streets and well as based on the time spent. Their role is in any case most often an essential one that is useful to many cities and towns and to some degree to the inhabitants who prefer to save their time and strength rather than use it to get water. In this case, better off families who have a private hook-up may sell water to some of the homes in their neighbourhood. In most towns and cities, these sellers are not recognised and may often be considered to be illegal tradesmen. They set their own prices and sometimes turn it into an easy and lucrative trade that may lead to abuse, but they sometimes offer this possibility of making themselves useful to their neighbours or friends. Note that in some towns as in Côte d’Ivoire, this system has actually been encouraged and regulated by the water utility that has implemented special “commercial” water contracts. Less often seen, this source of supply were the quality of the water is not guaranteed, does at least enable access to water for domestic use by well owners who then resell part of it to their neighbours. Small private networks are networks set up by individuals investing their own money. These networks may be independent of the main network and take water from a well or they may be hooked-up to a main or secondary supply network. These small networks tend rather to supply private standpipes and not private hook-ups. The standpipes supplied by these networks often offer a better quality service in terms of water pressure available and opening times, even if the water costs more. Installing a public network in Brazil. So-called “condominiums” are a simpler way of envisaging an organised extension to regular water mains so that they can reach suburban neighbourhoods. The cost of installing and maintenance these extensions is shared by a group of inhabitants just like any joint form of ownership, hence the name. The main advantage of any such extension is that the pipes run through the private property held by families who are members of the condominium. Hence network sizing does not have to meet official constraints or standards set out for pipes that pass under public roads. One third of the population of the capital of Burkina Faso, i.e. 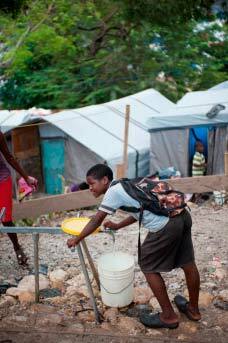 some 300,000 people live in suburban neighbourhoods long considered to be illegal and which until 2008 and for lack of any State recognition, were not served by ONEA (Office National de l’Eau et de l’Assainissement), the national water and sanitation utility. Then the city saw the wisdom of no longer ignoring them and acknowledging their existence and starting a vast programme to end the isolation of these outlying neighbourhoods. This program was paid for by AFD (Agence Française de Développement) the French aid agency. This programme comprised installing simplified networks to carry water and supply standpipes with management contracted out. 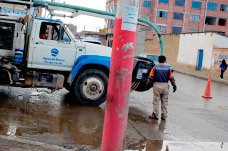 Late 2009, the city recruited a local operator, most often a private one, in each neighbourhood, then selling the water at bulk prices to them. This water was then resold by the operator to the residents in their neighbourhood, so long as they applied the national public price set in Burkina Faso. A number of these concession holders were community groups or resident’s associations from these neighbourhoods. In 2010, 65 standpipes were set up allowing an additional 100,000 people to be served, including 800 families who gained private hook-up offered at a price subsidised by the city.